This is a course for musicians – of an intermediate level and above – who wish to develop their arranging skills through ensemble playing. Players of all instruments welcome, but this course caters particularly well for harpists, under the dedicated tuition of Moira Gutteridge. Part of the time the group will be split in two, allowing for focused tuition with Moira for the harpists, while all other musicians work with Peter. Plenty of time for playing as a full ensemble, to share and try arrangements, and also time to work in smaller groups to devise arrangements based on the skills developed through the course. You’ll also learn and practice tunes for dancing, with one evening taking the form of an informal dance for local dancers, called by Madeleine Smith, who works closely with Moira and Peter to select suitable tunes and dances. This course is for players of an intermediate level and above. To get the most from the weekend you’ll need a good knowledge of your instrument and some experience in ensemble playing. Music is available in advance and can be emailed or downloaded nearer the time. 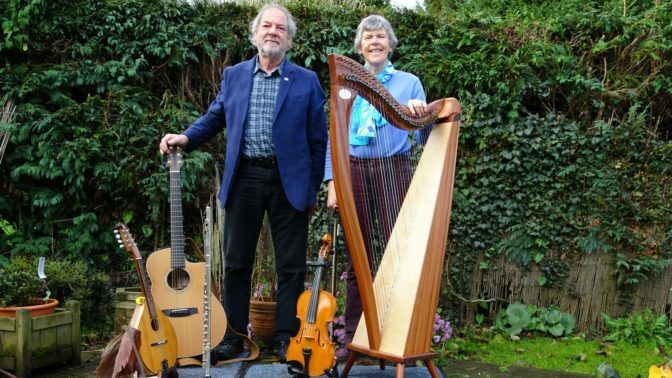 Moira Gutteridge plays fiddle, keyboard and harp along with Peter in their band ‘Dampier’s Round’, playing at dances and festivals throughout the country. Moira is an ex music teacher: she has organised and run music workshops at festivals, folk camps and at Halsway Manor on several occasions. She runs a village folk band for all ages and abilities, and with a wide range of instruments. Peter Gutteridge plays guitar, bass guitar, mandolin and flute. He is an ex BBC engineer, and more recently a teacher. He also runs workshops at festivals and folk camps and, with Moira, is part of the band that plays for Soft Option Appalachian Dancers. Madeleine Smith is a nationally renowned teacher, caller and clog dancer. She is sought after for her extensive knowledge of dancing and the folk tradition, and for her ability to teach clearly while making it fun. She plays recorder, piano, and Celtic harp, and is equally at home helping musicians to improve their playing. She also sings in a community choir, and plays for Towersey Morris.